White-collar Gender Discrimination in China: How legal system fails to protect women’s employment rights? Inherited from the traditional Confucians value, men have played a dominant role in China, and women have suffered gender discrimination in multiple surfaces including health, education, expectation of social roles, and job markets. 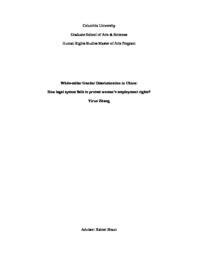 In this paper, I focus on women’s employment rights and gender discrimination at workplace in China. Despite joining international conventions and having general domestic laws against discrimination, women in China are treated unequally and less favored in the entire occupational lifecycle, including job selection, recruitment, allocation, training, promotion and benefits, firing, retirement, and pension. By examining policies and practices against white-collar women in regard to recruitment process, employment benefits, and sexual harassment, areas where the most common types of discrimination occur, I intend to identify three factors contributed to the inefficiency of the Chinese legal system in protecting female employees against gender discrimination: 1) Gendered stereotypes and social norms, 2) Inadequate legal and political regulation, and 3) Sketchy employer practices.